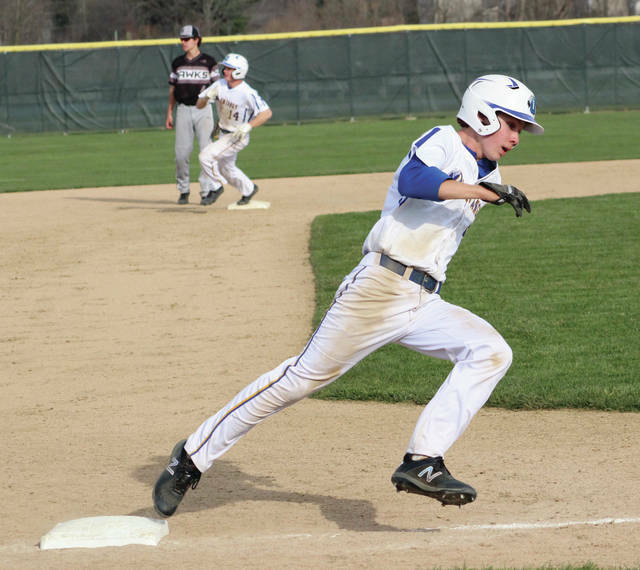 Olentangy’s Connor McCulty rounds third base and heads for home during Friday’s OCC showdown against visiting Westerville Central. The trail runner, Cole Robinson, went to third on the play. It would have been easy for Olentangy shortstop Connor Haag to swing for the fences the day after clubbing three home runs. But, he stayed with his approach and collected three hits, including a go-ahead RBI double to lead the Olentangy baseball team back from a four-run deficit to beat Westerville Central 11-8 Friday night in Lewis Center. The win avenges Olentangy’s only OCC-Buckeye loss, also keeping it tied atop the OCC-Buckeye standings with rival Olentangy Liberty. Olentangy (9-3, 5-1) has continued to play well despite the absence of a couple of its key players. Caden Kaiser (wrist) and Josh Moeller (hand) are due to be back by the end of next week. Haag and Connor McCulty have stepped right in and flourished. McCulty had two hits and scored twice, including the go-head run in the second inning off Haag’s double. Niko George gave the Warhawks the early lead with a RBI single in the first. Dax Mickley followed with a two-run double and Allen Smith followed with a RBI double later in the opening frame to push the lead to 4-0. “It was sink or swim time and we challenged them when they came back into the dugout,” Lucas said. Olentangy scored three times in the bottom half to get it close before rallying for four runs in the second to take the lead for good. Sutton Bucci’s two-run double provided the big blow in the inning. Haag added a two-run double in the fifth to put the game out of reach at 11-5. Central scored three runs in the sixth to get it to the final margin. Camron Hubble and George each had RBI singles to finish with two hits and a pair of RBI apiece. Mickley drove in three runs on three hits to lead the Warhawks (6-5, 4-2) and Matt Beck tossed an inning-plus to take the loss. Logan Ketron settled down after a rocky first inning, going five to get the win and Nate Wilhelm finished out the last two innings for Olentangy. Next up, Olentangy is slated to host Teays Valley in non-league action today at 11 a.m.